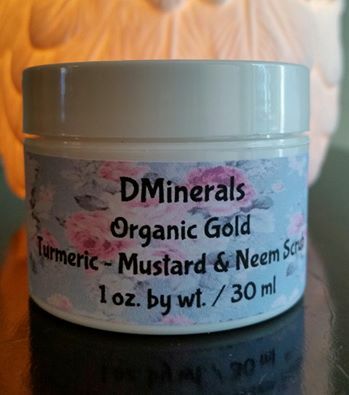 DMinerals "Organic Gold Turmeric-Mustard & Neem Body Scrub is filled with so much goodness ! Our wonderful body scrub smells sooo inviting with our Organic Grapefruit Essential Oil along with Organic Rosemary Leaf Extract. ! Really great for that oily skin problem. Organic Rosemary Leaf Extract has natural antiseptic properties-ability to kill viruses,bacteria,fungi. ..It helps stimulate cell renewal for healthy healing. Relieves muscle pains-warming and purifying . Directions for use: Apply on wet skin with fingers gently in circular motions...Rinse thoroughly and pat dry. This is a body scrub you will want to experience !